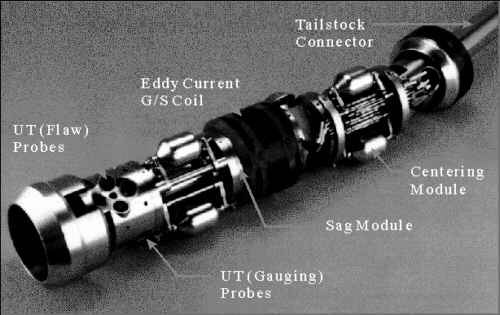 Fuel channel pressure tubes are critical components at the heart of the CANDU reactor core which require periodic inspection to demonstrate continued fitness for service. Ontario Hydro uses a remotely controlled inspection system, known as CIGAR, to perform the mandated inspections. This paper discusses in detail the application of ultrasonic testing methods used for flaw detection, characterization and sizing. A CANDU reactor consists of a large tank, the calandria, which is penetrated by several hundred horizontally mounted fuel channels containing natural uranium fuel bundles. The fuel channel consists of a 104 mm diameter, 4.3 mm thick Zirconium - Niobium pressure tube, inserted into slightly bigger calandria tube, and two stainless steel end fittings at the ends of the fuel channel. The tubes are 6.3 m long. Garter Spring spacers separate the two tubes. Heavy water flows through the pressure tubes, removing heat from fuel bundles and transferring it to steam generators, where secondary circuit light water is being heated and converted into steam to run the turbine. During reactor operation, pressure tube material is subject to high pressure (up to 11.3 MPa), high temperature (up to 310° C) and very high gamma and neutron radiation fields. As it can be easily seen from the above, from the NDE inspector's perspective, the CANDU reactor represents a collection of pressure vessels - an inspector's dream. CANDU reactors are currently operated in Canada (Ontario, New Brunswick and Quebec), Korea, Argentina and Romania. Other similarly designed Pressurized Heavy Water Reactors (PHWR) are operated in India and Pakistan. Inspections falling under the Periodic Inspection Program are mandated by Canadian Standard CAN/CSA-N285.4-94, which states that: "The purpose of periodic inspection is to provide an assurance that the likelihood of a failure that could endanger health and safety has not increased significantly since the plant was put into service" - CAN/CSA-N285.4-94. The economics of CANDU reactor provide a strong incentive to actively manage pressure tube life. Hence, a supplemental inspection program - an In-Service Inspection Program was developed by Ontario Hydro. The inspections falling into this category are initiated to monitor the integrity of pressure tubes which are judged to be at higher than average risk due to known causes such as manufacturing flaws, fabrication variances, and commissioning, operation or maintenance induced damage. These inspections are often implemented to better understand a particular pressure tube phenomenon. In practice, Periodic and In - Service inspections are often performed together. Inspection programs are designed in such a way as to minimize inspection effort and maximize the amount and usefulness of information obtained. For Ontario Hydro reactors, the total number of inspected channels is approximately 5 to 7 times higher than the minimum required by the CSA Standard. Brief description of Pressure Tube Inspection Systems currently used by Ontario Hydro. As mentioned before, the inspection of CANDU pressure tubes may seem like an inspector's paradise - large number of pressure vessels to inspect. Reality, however, is somewhat less appealing; pressure tubes are flooded with radioactive heavy water and high radiation levels not only mandate that the inspection device be remotely controlled but also put additional requirements on the materials used. 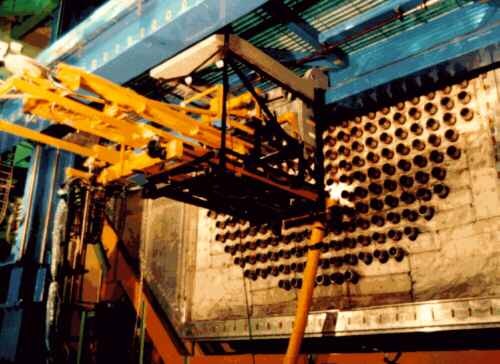 For example, most of the commercially available cables become brittle and insulation cracks relatively quickly in the reactor environment. A whole range of radiation related effects are observed, and are regarded as critical for ultrasonic probe performance. For example, radiation damage can result in disbonding between transducer crystal and damping mass. Such phenomena can cause loss of amplitude calibration during inspection and may lead to probe failure. To put it briefly, the environment is extremely hostile. CIGAR operation is the culmination of many years of lab and field work and experience. As a result, a robust, reliable inspection system, capable of fulfilling reactor inspection requirements, has been developed. The CIGAR system consists of: a drive unit, which is installed on the fuelling machine bridge during an inspection; a local control console, located in the containment; a remote control console, located outside containment, usually in the trailer; a containment penetration and associated cabling; and an inspection package inserted in the channel by the fuelling machine. The inspection package consists of an inspection head, and a modified closure plug. The inspection head's tailstock extends through an opening in the modified closure plug, allowing for CIGAR rods to be connected to the head, both mechanically and electrically. This opening is equipped with seals so that no loss of heavy water coolant would occur. The presence of heavy water in the system is actually used to the inspection benefit: the heavy water is used as a couplant for ultrasonic immersion probes. Signal lines run through the tailstock and extension rods, transferring signals from sensors to the data acquisition equipment in the remote console. Rotational and axial movement is transferred to the inspection head via the extension rods, allowing the pressure tube material to be inspected in a helical fashion. Other modes of motion are available - depending on the inspection device installed. A total of three computers are being used to control the inspection system and process acquired data. For a CIGAR inspection to be performed, the reactor must be shut down, depressurized and cooled down, and fuel removed from the channels to be inspected. As already mentioned, the CIGAR inspection system is capable of providing a whole range of inspection services. The main function of the system is to provide volumetric inspection capability. This is achieved by employing ultrasonic testing methods. General description of CIGAR inspection capabilities can be found elsewhere. This paper will be limited to the description of ultrasonic testing systems used by CIGAR for flaw detection, characterization and sizing. Other systems, such as channel gauging, pressure tube sag measurement system or Eddy Current Garter Spring detection system will not be dealt with in this paper. The flaw detection methodology is based on the requirements of the Canadian Standard CAN/CSA-N285.4-94. The Standard requires that an amplitude based inspection philosophy be used when performing periodic inspection of pressure tubes. The currently used calibration reflector is a rectangular notch, 6 mm long, 0.15 mm deep and 0.15 mm wide. In fact for the actual system calibration we use four such notches: axial ID, circumferential ID, axial OD, circumferential OD. To put this notch size into perspective, please recognize that 0.15 mm is a thickness of two paper sheets stacked on top of each other. This notch depth represents 3.5% of tube nominal thickness. For general flaw detection scan, CIGAR currently employs four focused, immersion probes, 10 MHz nominal frequency, configured in such a way that the individual beams enter the pressure tube material at 45 degree angle (refracted shear wave). The probes are grouped into a probe cluster. Two probes constitute an axial pair and two constitute a circumferential pair. All four beams meet at the same point on the pressure tube ID (full skip). Thus, any flaw is being looked at from four different directions. A fifth probe is used as a normal beam probe. It has to be noted, that the name shear wave probes is used for the probes which create shear waves in the pressure tube material. Obviously, the probes themselves are longitudinal wave probes. The probes are pulsed sequentially by a five channel UT instrument. In the flaw detection mode all probes work in a Pulse Echo mode. The instrument currently in use is a Krautkramer Branson KB 6000. It is in the process of being replaced by Krautkramer Branson USIP 20. In the past, we also utilized Remote Pulsers Preamplifiers (RPP's) at the drive unit in order to boost the ultrasonic signal transferred over long cable lengths (total cable length between ultrasonic instrument and ultrasonic probe is approximately 155 m). The RPP's were awkward to troubleshoot due to their locations on the drive unit. Refinements in the ultrasonic system allow us now to use the probes without RPP's. Shear Wave probes - three gates are set up in order to monitor the Interface, the OD (half skip) and the ID (full skip). Over every 0.1 degree of the rotary motion, the highest amplitude signal from each gate is being read by the instrument and sent to the Data Acquisition Computer. The computer processes the data, sends it for storage and displays in the form of visual plots. The software used for this operation is an Ontario Hydro proprietary software. The software also performs some limited data analysis functions, by flagging indications which exceed preset thresholds. 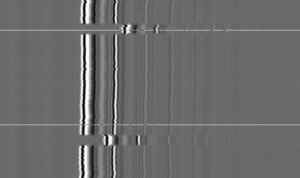 These indications are then investigated by the data acquisition crew in order to verify whether further additional scans are required. 10 MHz Normal Beam probe - the data acquisition gates are set up to monitor material range between Interface and First BackWall, between First and Second BackWall, Second BackWall and Third BackWall. Each of these gates has its specific purpose, but over the years we have learned to specifically respect Normal Beam Second Back Wall amplitude drop as a very potent flaw detection and analysis tool. The displays are relatively user friendly and do a good job of visually representing the data collected. As mentioned before, system calibration is done using 0.15 mm deep notches. The circumferential probes use axial ID and OD notches for calibration, the axial probes use circumferential ID and OD notches. The actual scanning is done at +4 dB levels, i.e. gain is increased by 4 dB above notch sensitivity. All data is acquired and stored, regardless of the signal amplitude. The flagging occurs for indications of concern. Flagging thresholds for these indications are normally set at half the notch level (-6 dB) but in some areas of the tube the thresholds are set at 20% (-14 dB). The indications exceeding thresholds are subject to sizing scans and further evaluation. Detection scans are run in helical pattern. The helix pitch is adjustable by the operator. Currently used pitches for general flaw detection scans are 1 and 2 mm - depending on the area of the tube. Ultrasonic transducers installed in the inspection head are manufactured to very strict requirements contained in Ontario Hydro specifications. Probe relative sensitivity, bandwidth, centre frequency, beam skew and beam offset are strictly controlled. In order to illustrate difficulties associated with manufacturing of such probes, I would like to mention that the beam skew is considered acceptable within +/- 0.5° , and probe must be capable of working at least 200 hours in the reactor environment, without changing any of its characteristics. B-scans constitute our basic tool for flaw characterization and sizing by ultrasonics. B-scan is usually defined as collection of A-scans stacked up together to form and image, which resembles a cross section of the material being inspected. The B-scans have gained significant popularity in recent years due to widespread application of automated inspection systems. The full waveform digitization at increased density of data collection points was made possible due to enormous increase in the computing power of today's personal computers and development of high speed digitizers. Data processing capabilities have also improved, enabling fast data handling, colour images with different colour spectra and other cool features to be employed for data analysis. As with other ultrasonic inspections, all these methods have their specific areas of application, but in some complex cases all of the above mentioned methods are being used for flaw characterization and sizing. I would like to describe some of the features of the above methods in order to demonstrate their usefulness as high quality ultrasonic measurement tools. With the exception of the 20 MHz probe, which is installed in the inspection head specifically to perform the B-scans, all other probes used for B-scans are the same probes already installed for the flaw detection scans. They are also being pulsed by the KB 6000, although the way the UT instrument is controlled by the computer is now slightly different. The currently employed probe is a nominal 20 MHz, 10 mm Focal length and approximately 6 mm crystal diameter transducer. This probe is installed in such a way, that it focuses slightly below ID surface. The probe is too weak and too highly focused to achieve good penetration through the tube material, but is very good at inspecting the water - metal interface area (tube ID). The probe beam diameter in the focal spot is only about 0.5 mm ( 6 dB beam). Such narrow beams provide excellent lateral resolution capabilities. If all that seems like splitting hair into four, I would like to remind you that the 0.15 mm deep flaw in the pressure tube is subject to an engineering assessment according to the Standard. In the assessment process, the reactor owner provides sufficient evidence to the regulatory body, that the pressure tube is fit for service. Only upon acceptance of such evidence can the fuel channel be returned to service. Such evaluations require very detailed flaw measurements and profiling. Figure 5 provides images of some flaws characterized by the Normal Beam B-scan system. In the configuration used previously, the 20 MHz probe was pulsed by KB 6000 via Remote Pulser Preamplifier installed on the drive unit. Experimental work performed on optimizing probe working conditions has proven that remote pulsing of such probe is possible even with such long cables, if the driving pulse shape is optimized for the specific probe. This has lead to the implementation of a "modified B-scan system" in which, the 20 MHz probe is pulsed by UTEX 340 Pulser Receiver, located conveniently in the inspection trailer. The UTEX is synchronized with the KB 6000 and feeds the received signal back to the KB 6000, which in turn sends the received waveform to the data acquisition computer for digitizing, storage and processing. The data collection gate is adjustable, but because of a limited useful range of the 20 MHz probe, it is normally set to cover a little bit more than the material thickness. This transducer has much improved penetration capabilities, when compared to the 20 MHz transducer, so the B-scans collected are used for evaluation of flaws in the material itself (not open to any of the surfaces) and OD flaws. The collection gate is normally set up to cover several back wall indications. This probe is also used for very precise material thickness measurements in proximity to a flaw. Obviously, the increased penetration power comes at a price: this probe beam is not as highly focused as the 20 MHz probe beam and subsequently, lateral resolution of the method is worse than that for the 20 MHz transducer. These B-scans accord an opportunity to look at the flaw from "below", thus making it possible to characterize flaws which may not be open to the surface, tightly closed or contain an undercut. 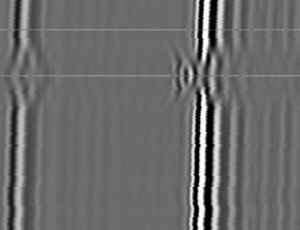 Ultrasound travels through the pressure tube material in a "W" fashion. 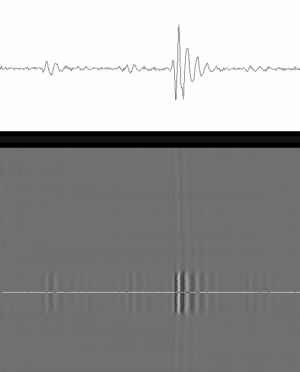 A flaw will shorten the ultrasound paths, thus enabling us to measure time shift between bottom of the flaw and soundpath through undisturbed area of the tube. Currently, diffracted signals are not used for these measurements, but rather small signals reflected from facets of the flaw are used. Use of focused shear wave probes makes this possible. The probes employed have 6 dB beams in the order of 0.85 to 1.2 mm which makes them extremely sensitive to reflections coming from even very small reflecting surfaces. Normally the Pitch Catch B-scans are performed by both probe pairs, circumferential and axial in order to maximize available information. These B-scans have only been implemented over the last few years and quickly proved themselves as an effective characterization tool, although measurements themselves are rather difficult. The method is currently being used as a complementary method to B-scans methods described previously. Measurement accuracy achieved by ultrasonic B-scan systems. The theoretical limit of the measurement accuracy is usually determined by its resolution. The resolutions currently implemented are quite high: 7 microns for 20 MHz Normal Beam probe, 14 microns for shear wave B-scans and 21 microns for the 10 MHz Normal Beam transducer. A B-scan Verification Program has been conducted , verifying measurement accuracy in real life situations, i.e. including actual inspection equipment and procedures, and human performance factor. Achieved accuracies have not deviated much from the theoretical limit. On a number of measurements (2500 data points) it has been proven that the ID flaws can be measured with accuracy of +/- 20 microns with the 20 MHz probe. The accuracy of the Pitch Catch methods is somewhat lower, but still results in an impressive +/- 40 microns. The verification project has also proven that there is a tendency in the system (that includes the data analyst making the final call) to slightly, but consistently, oversize measured flaws. As mentioned before, pressure tube inspection is performed in two phases: phase 1 is an amplitude based inspection for flaw detection, phase 2 consists of flaw evaluation scans. Preliminary evaluation of data is done by the data acquisition crew, before coming off channel. This evaluation usually involves review of flagged indications (indications which exceeded preset threshold values) in order to establish whether further (sizing) scans are necessary. If a decision is made to perform additional scans, they are performed and CIGAR can then come off channel. As you can imagine, reactor down time is extremely expensive, so economy dictates that on channel time becomes minimized. The current practice calls for final data analysis and flaw sizing and characterization to be done off channel. Usually there is about 12 to 24 hours lag between channel inspection and completion of data analysis. The CIGAR pressure tube inspection system has been operated successfully over the last twelve years. The demand for its services has been very often much greater than our capacity to perform the inspection services. Pressure tube inspections with CIGAR technology have been performed on all Ontario Hydro reactors, CANDU units in New Brunswick (New Brunswick Power) and Quebec (Quebec Hydro) and in Korea. The system undergoes constant improvement and changes. Its ultrasonics has proven itself as a reliable, accurate detection, characterization and sizing tool for pressure tube flaws. The development work continues in order to improve speed of inspection and quality of collected data.